According to Scripture, God deliberately designed the gospel in such a way so as to strip me of pride and leave me without any grounds for boasting in myself whatsoever. This is actually a wonderful mercy from God, for pride is at the root of all my sin. Pride produced the first sin in the garden, and pride always precedes every sinful stumbling in my life. Therefore, if I am to experience deliverance from sin, I must be delivered from the pride that produces it. Thankfully, the gospel is engineered to accomplish this deliverance. Preaching the gospel to myself each day mounts a powerful assault against my pride and serves to establish humility in its place. Nothing suffocates my pride more than daily reminders regarding the glory of my God, the gravity of my sins, and the crucifixion of God’s own Son in my place. Also, the gracious love of God, lavishing on me because of Christ’s death, is always humbling to remember, especially when viewed against the backdrop of the Hell I deserve. Pride wilts in the atmosphere of the gospel; and the more pride is mortified within me, the less frequent are my moments of sinful contention with God and with others. Conversely, humility grows lushly in the atmosphere of the gospel, and the more humility flourishes within me, the more I experience God’s grace along with the strengthening His grace provides. Additionally, such humility intensifies my passion for God and causes my heart increasingly to thrill whenever He is praised. 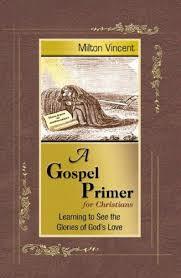 For a free PDF copy of Milton Vincent’s book click here. I highly recommend getting this book. It’s fantastic.